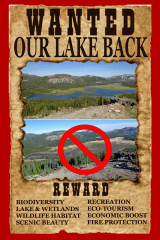 In this post we would like to continue looking at some of the questionable tactics TDLT is using to try to get their permit from Nevada County to drain Van Norden lake and wetlands. Last time we looked at “piecemealing”. This time let us look at what we’re calling “snapshotting”. 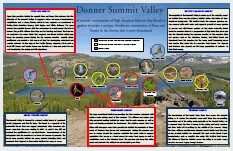 Everyone familiar with the Donner Summit area knows that it experiences pretty extreme seasonal changes. The winter brings some of the heaviest snowfall in US with an average of 34 ft of snow a year. In spring that snow melts and the summit is inundated with running water that fills its streams rivers and lakes. During the summer that water drains out of the mountains and the summit drys out, only to be re-hydrated by the autumn rains. The result of all this seasonal change is that the landscape of the summit is constantly changing throughout the year. So when you consider changes to the environment up here, you really have to consider the impact of those changes for the entire year. This is especially true with Van Norden Lake and its surrounding wetlands. Traditionally the lake fills up starting as early as November if the fall rains are heavy. During the winter the surface of the lake freezes and snow accumulates. During the spring and early summer the lake and wetlands are inundated with melt water from the surrounding watershed with the excess running down the South Yuba river. And during the summer and fall the lake has stored some of the melt water to keep the surrounding willow thicket wetlands hydrated to provide wetland habitat throughout the summer. Now TDLT wants to drastically disrupt this cycle by permanently draining the lake and wetlands. However, to avoid looking at the impact of their project on the entire seasonal cycle, they have picked just one “snapshot” of the cycle to try and set the environmental “baseline” at. It is probably not a surprise to anyone that the time they have chosen is when the lake and wetlands are drained. And just to be clear, it has been drained by them. It is no coincidence that TDLT waited until this particular time to submit their project to the County and try to pretend that there is no lake and wetland in the Summit Valley. The aerial pictures that they submitted with their application shown in Figure 1 tell the story. The pictures are supposed to support their argument that there is no lake in the valley and therefore there is no need for environmental evaluation of their draining it. They have made a perfect circular argument. They are applying to permanently drain the lake and there is no reason to question this because they have already drained it. One problem. For at least half of the year, there is a lake in the Valley. Currently, the spillway is intact and the only outlet from the lake is over the spillway or through a 24 inch drainpipe. The drainpipe only has the flow capacity of about 30 cubic ft per second. There are 6000 acres of water shed that must drain through the dam and with even a few inches of rain, the flow through the valley can reach hundreds of cubic feet per second. The result is the flow is much greater than the drainpipe can drain, the lakebed fills up, and the excess water flows over the spillway. Even with the drainpipe open the lake remains filled through the winter, spring and early summer as shown in Figure 2. It is only when most of melt water has flowed down the Yuba River and the input of surface water into the valley falls below 30 cubic feet per second that the lake starts to drain. That happens to be right around July 7th when the pictures in Figure 1 were taken. 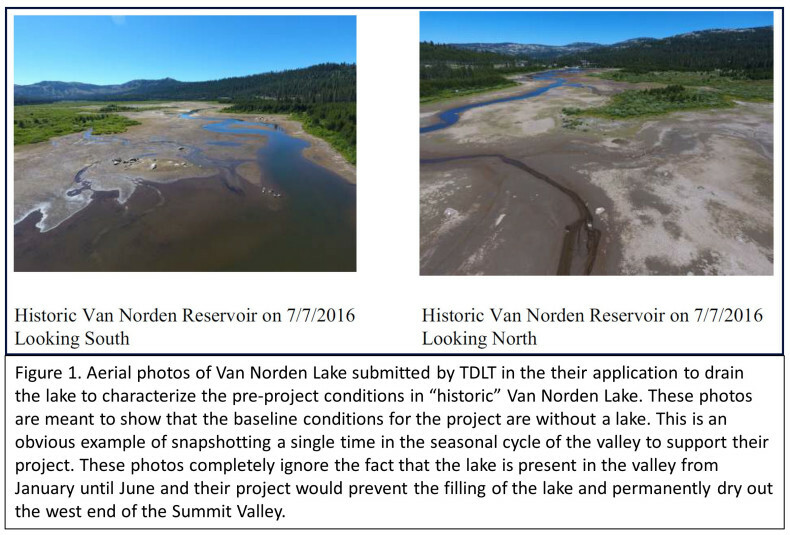 While the seasonal fluctuation is very convenient when you need a snapshot to support your project, the truth of the matter is that this maneuver is totally misleading to an environmental evaluation of the project to drain Van Norden lake. But it doesn’t stop there. While the “no-lake” baseline that TDLT is trying to set would prevent environmental scrutiny of existing lake and wetlands, the timing of the pictures also misses the true impact of the draining. 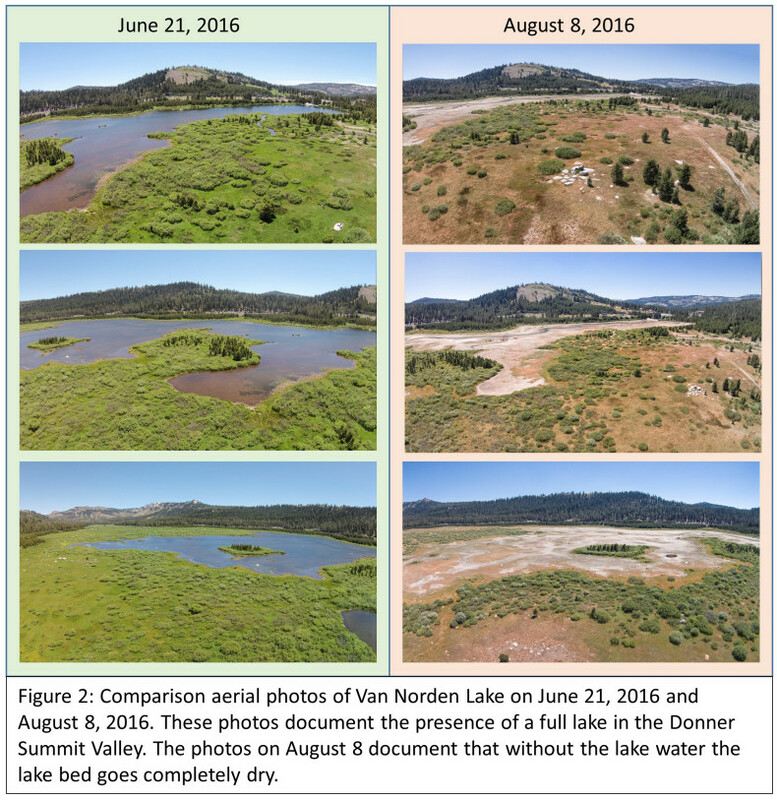 As the pictures from August 8 in Figure 2 show, just a month after the draining, the lakebed has gone completely dry. The impression TDLT wants to leave is that after the project there will be a small amount of water left in the valley with some “mud flats”. The truth is that the valley will be completely dry after they drain the lake. The mudflat conditions will again be only a small snapshot of the season. You need only walk out on the dry lakebed anytime in August, September or October to see the effect. Consider one last thought on this point. If TDLT does lower the spillway 5 ft, Van Norden lake will never fill up and all the melt water will leave the valley much earlier in the season. As much as they would have us believe that the lake is already gone, even now it is keeping the surrounding wetlands hydrated into the middle of July. If it is removed permanently, there will be only a few weeks of inundation during the spring. The west end of the valley will become seasonal wet/dry meadow just like the east end is now (see this post). No lake, no wetland, no water. Thankfully Jessica Hankins made a field trip to Van Norden “Lake”. With this trip combined with your before and after pictures…the TDLT “snapshotting” trick won’t work.